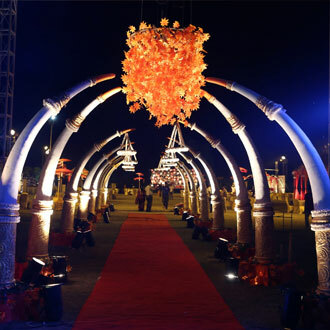 The Wedding industry is a fast growing segment of the tourism sector in India. Destination weddings are a worldwide phenomenon, which not only creates wonderful memories, but also generates huge business opportunity for any hospitality player. We at the Aquamarina Park & Resort beautifully translate fabulous themes into dramatic realties of an exotic, one-stop location. The perfect choice for this mid size wedding theme (250 to 300 people), can be easily spread over Banquet1 and Banquet2 . 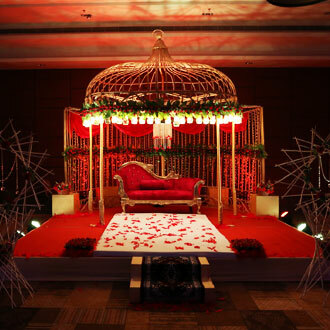 Banquet1 is perfect with indoor-outdoor set up, ample welcome space, it can accommodate both intimate mehndi function as well as ritualistic wedding. 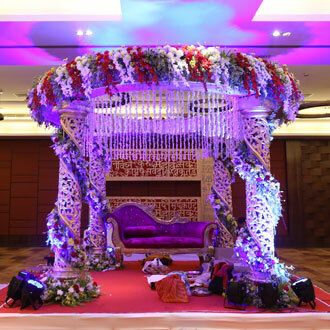 Banquet4, on the other hand is cosy, personalized well matched for a family only affair with a plush hall of 830 sq.ft., opening up to an adjoining lawns of 2000 sq.ft. Secluded, with privacy and amidst thick of nature, this venue accommodates 50 to 70 guests comfortably. If your choice is mostly indoor luxury for a traditional experience, look no further as Banquet2 and the Aquamarina Park & Resort are excellent choices. Catering to a beautiful hall space of 3120 sq.ft., with an adjacent pre-function area of 960 sq.ft. Banquet2 (150 to 200 people) overlooks the lotus shaped central pool of the resort. Add to that the breathtaking Beautiful Bar (30 to 35 people) at dusk, for your younger guests. Relaxed and sweet mornings, pampering and rejuvenation with Ayurvedic therapies, locavore menu, Sufi entertainment and regional splendor. And, if you believe in the Aquamarina Park & Resort signature style, there's no stopping you from choosing the Cerebrum.